New - Rename User Blocks! No more user blocks with names like 2018-06-08 21:03:12. MobiRub PRO is the Add-On Tool for Mobirise that now allows you to rename your user blocks with easy to recognise descriptive names. An easy to use program that will easily and quickly rename your saved user blocks! Simply browse to your userblocks folder select a user block, give it a new name and click update. Your block now has your chosen name instead of a date and time. Some Saved User Blocks, from Mobirise 3 or 4 Templates or Extensions. Works on user blocks saved from Mobirise Version 3 and 4 themes and extensions. Gives the block your descriptive name instead of date and time. 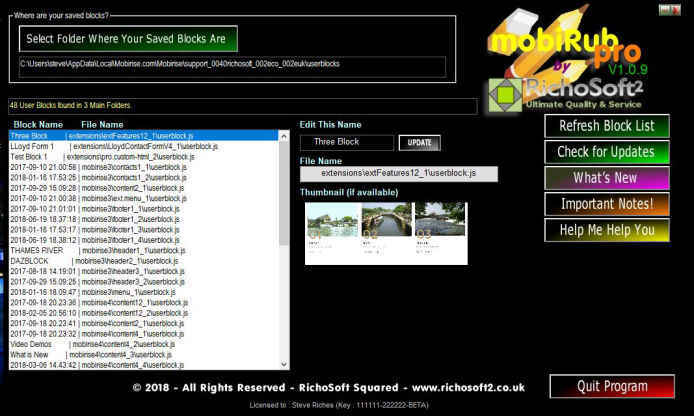 Automatically reads all userblock folders and displays a sample thumbnail for the block (if available)..
MobiRub PRO is being updated from time to time, so if you already have V1 click the Check for Updates at the top of the main page monthly to see if a new version is available. If you have downloaded MobiRub today, once you have installed it, click the Check for Updates link at the top of the Main Page make sure you have the latest version. Due to continued development and enhancements features and operation may have been updated since the video was produced, so there may be more features than those shown. User Guide - In your pack you will also receive a comprehensive user guide to help you install and use your system. Support and Help - I pride myself on my support, and FREE support is included. VIP MEMBERS GET A SPECIAL PRICE OFFER - Log In to the VIP Members Area to get your Coupon Code!. Get It, and more info here! * Mobirise and the Mobirise Logo are trademarks of Mobirise.com and are acknowledged as such.